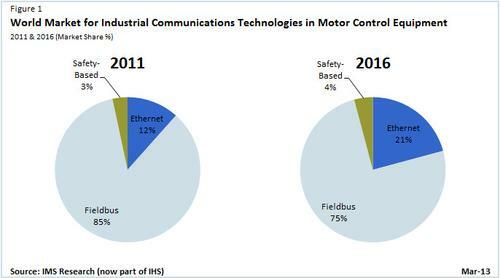 Two recent studies by IMS Research (now part of IHS Inc.) highlight the high growth rate of Ethernet motion network, and also the long-term sustainability of fieldbus infrastructures.The use of Ethernet with motor drives and motion controllers is forecast to more than triple in 2016 — from 1.8 million new connected nodes in 2011. The highest compound annual growth rate is for new motor control Ethernet nodes at nearly 30 percent in that timeframe. At the recent Hanover Fair, Design News spoke with IMS analyst Tom Moore, the author of the study, who said that Ethernet drive and motion control applications are growing at an impressive rate. At the show, the EtherCAT Technology Group highlighted the 10-year anniversary of publishing the specification as a global IEC standard and reported that more than 2,300 members support the technology. Part of the transition to Ethernet is due to the protocols available such as PROFINET, EtherNet/IP, POWERLINK, and EtherCAT, which are all very well suited to motor control applications. In particular, EtherCAT is well known for very high-speed data transmission and low response times. Its adoption is forecast to grow very strongly to 2016, especially as its member count continues to increase. Ethernet nodes are forecast to account for more than 20 percent of the total new networked motor control products in 2016. This is an increase from the estimated 12 percent in 2011, when fieldbus protocols dominated new node connections. Ethernet is quickly gaining ground in the industrial market, which is known to be slow to adopt new technology. The impetus behind adoption is an overall push toward a single network in plants for both enterprise business systems and machine control networks. With Ethernet motion network protocols developing deterministic solutions suited for high-speed motion control applications, the availability of commercial Ethernet hardware and familiarity of the technology with users has had a significant impact on market adoption. A second study by IHS estimates that fieldbus protocols accounted for 75 percent of new industrial automation component network connections in 2011, even though it is projected to fall to 69 percent in 2016. New network connections using fieldbus protocols are still some way ahead that of Ethernet, yet growth of Ethernet connections is expected to be considerably higher to 2016. 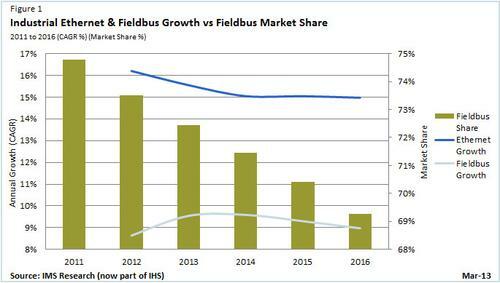 The future is still strong for fieldbus, with new connections still increasing year-over-year. However, it is undeniable that industrial Ethernet growth will remain higher than that of fieldbus. IHS believes that within 10 to 15 years, industrial Ethernet will be the dominant networking technology in industrial environments and almost all components will offer Ethernet connectivity as standard.